Your brand is the physical representation of your business's values, mission, and personality. It typically takes shape through your logo, fonts, choice of imagery, and language across both print and digital marketing materials (i.e., business cards and websites), however, as the world quickly moves to a more fast-paced communication style, and where social media is fast becoming a requirement for businesses, identifying your brand voice on social is a must. Brands that accurately hone in on a consistent brand voice for their social media accounts can more effectively build followers, establish trust, and generate better engagement rates. In this post, we'll look at how to find your brand voice to optimize your performance on social media. This is a great starting point when trying to find your brand voice for social. Your brand voice is something that's carried throughout all your marketing assets and helps create a recognizable tone of voice for your business. On social media, a more casual and conversational feel is generally preferred, so tweaking your brand voice for social is likely necessary. If your brand voice is highly cultivated and identifiable, add a human element to your social media commentary to incorporate the personal feel followers look for. In this instance, consider your social media voice as a brand tone, which is a context-dependent spin on your brand voice. It's related to your brand voice, but is noticeably different from your mass communication (direct mail, website content, or flyers) language. Need a visual? CoSchedule developed the following diagram to show how your brand voice and tone come together to form the perfect social media voice. Try answering the questions in each quadrant and your social media voice will start to take shape. As you identify the nuances between your brand voice and brand tone, remember that being genuine will never lead you astray. Audiences respond to honest and candid language, so don't be afraid to start with what feels right and build your tone from there. It's OK if you don't have an established brand voice for your business, you can still use this exercise to dig into what differentiates your brand from your competitors and create a voice that makes your brand noticeable on social media. Think of your brand voice as your social media personality, and a way to mold your audience's opinion of your business. Whether it's formalized or not, your business has a culture all its own. You have a mission statement, business values, a brand promise, and ideals that inform every decision and action. It only makes sense to reflect your culture in your social media communications. Your customers and local (or virtual) community speak in a specific way - use their cadence, lingo and vocabulary to craft your brand voice. If you're in a niche industry - such as a bakery or online craft store - look to your customers and peers and study their tone of voice. You want your audience to feel like you know them and literally speak their language. Developing a brand voice that comes across as their peer or an approachable expert is a way to stand out and get your social audience's attention. Lastly, your business is (or will be) active on social media. But why? Ensure your social media presence is valuable and worthwhile to your followers. Delineate what you're bringing to the social media table, so to speak. Are you providing industry expertise or educational information? Are your social accounts a place for one-on-one support? Once you've determined why you're on social, your brand voice will become much clearer. Whether you're starting anew or building on an existing brand voice, everyone can use assistance in perfecting their social voice. 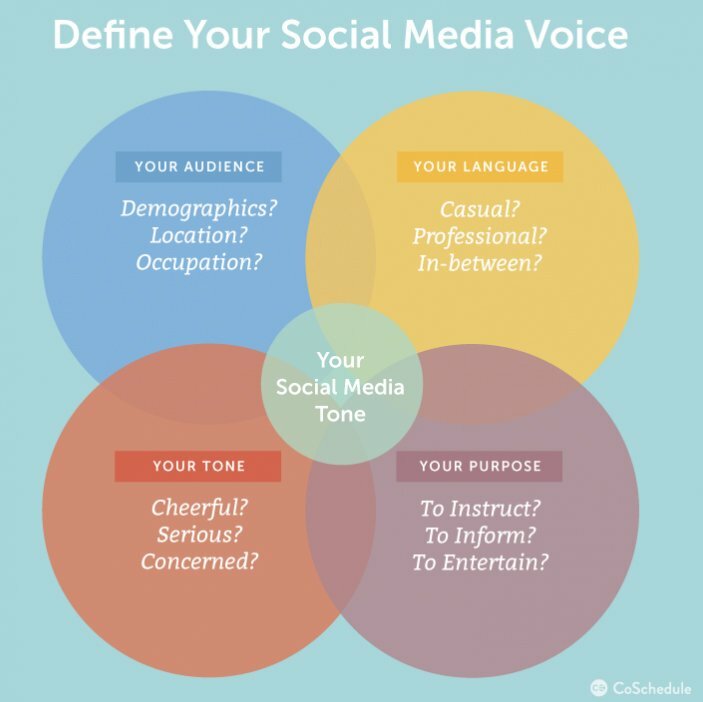 Content creation company Gather Content has created another great model for identifying your tone of voice on social media - simply fill in the circles below and you're on your way to building the best brand voice for your business. Once you've completed the chart, save it as a reminder as to why you're on social media and who you want to be for your followers. When a brand uses a consistent voice, it breeds trust and becomes instantly recognizable. Having this visual cue will keep you on message and on brand when on social media. Remember, social media is meant to be fun and informative, so don't stress too much about getting it right from the get-go. You can always refine your voice as you see how people respond to your posts and captions. With these tips and tricks, your business will be on its way to developing the best brand voice for social media.